This was one of our shortest days of flying, since we had pushed a little the night before. We hung around the hotel in the morning, so that Nell could send her script off to the producers, and then made our way to the airport. There was weather around Charlotte and hanging over DC, so I had filed an instrument flight plan. 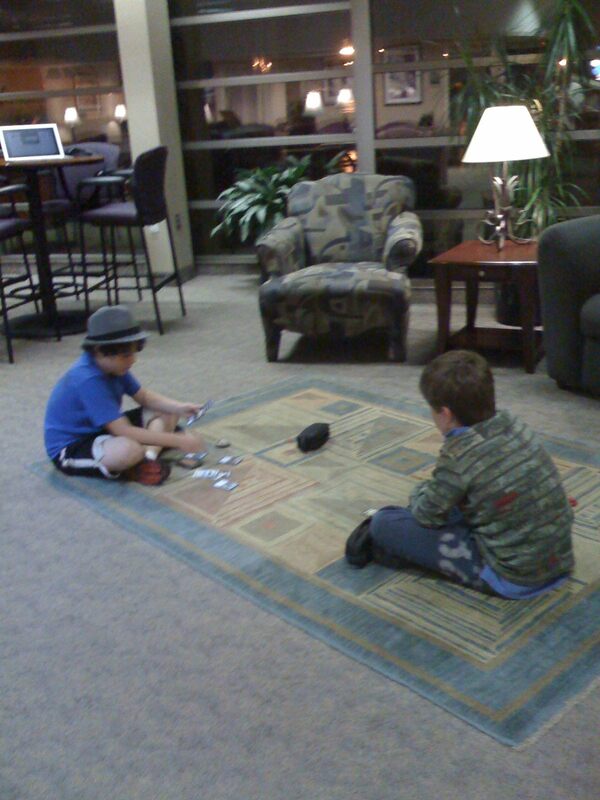 The passengers hung out in the comfortable FBO lounge while I loaded the plane in a wet wind. It wasn’t really raining, but the occasional gust picked up water from the runway and tossed it at me. While everyone was getting aboard I warned them that there could easily be a delay waiting for our departure slot. I was glad I warned them; there was nearly a ten minute wait just to talk to the clearance controller. He read my clearance to me, I read it back, then the ground controller had me taxi up to the main runway and hold short before I crossed it. We waited there another ten minutes. When we scooted across (while another heavy jet rolled into position down at the other end of the runway) we then continued our roll across the crosswind runway (where landing traffic was coming in very regularly) and got in line to take off. 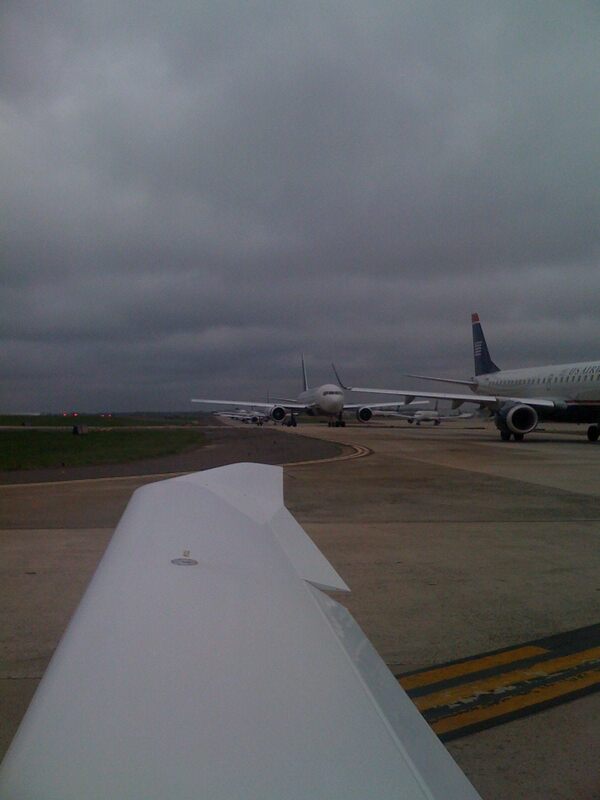 We were in line behind six huge passenger jets. These were Southwest-sized planes (Boeing 737s) or the Airbus equivalent (A320s). I stayed at least a city block back from the jet in front of me because even just the power they use to taxi is enough thrust to flip our little plane over onto its back. That would ruin our whole trip. There is a little airport closer to my brother than any large airport, but it is within a freedom-stealing piece of airspace known as the FRZ. It’s ridiculous to think that someone could do damage with a little airplane, but they continue to severely curtail the general aviation activity around the nation’s capital. Just more of the security theater that everyone is so fond of since 9.11. So we were flying into Dulles. It was just a little over two hours in the air. We were between layers almost the entire way, the overcast layer was below us by a couple thousand and there was another broken layer a few thousand feet above us. It was surreal. Way off to the right we could see the Atlantic. It was below freezing up at seven thousand feet, so I was working to stay clear of visible moisture. (Below freezing temperatures plus visible moisture equals ice forming on the aircraft, something our little plane is not equipped for.) Ice is not an immediate problem, I have had a little ice form on the leading edge of the wings before, but it would mean changing our flight path or getting cleared to a lower altitude. Down low we would burn more fuel and go slower, so I just asked for little deviations around clouds. And, in particular, I steered around some precipitation which showed up on our NextRAD weather radar images. The rain might have been below us, but I didn’t want to find out by flying through it. Freezing rain is the type of precipitation which forms ice the fastest on the plane. As we approached Dulles we were giving clearance to lower altitudes, and I felt better about heading into some of the clouds. On the way up I kept checking the weather at Dulles and for a lot of our flight it was right at the minimums for the ILS approach. It was fog, and that would be a little interesting for us. The runways were so long that I imagined it would be possible to hang at the minimum descent altitude and look for the runway for quite a while before we had to leave to land somewhere else (or to try again on the same approach). Half an hour before we got to Dulles a wind blew out a lot of the fog and the ceilings were a few hundred feet higher. That’s all we needed. The Dulles approach controller vectored us around for the approach and a couple business jets buzzed in right over our heads. We were slow traffic for him to have to deal with. When we got on the ground I had email from TW saying, “Hey, did you get a hold? What was that. That looked like some real IFR flying from here.” He had been watching us on FlightAware, a site which shows the radar track of the plane in flight. What he had seen was the tight loop on the final approach course where the controller realized that he had faster traffic coming up behind us, so he had to take us off the approach and then put us back on after that plane. We landed and taxied past the great Saarinen terminal building. I point it out to the boys and said that the last time they had been at this airport was last year’s spring break, when we flew in on JetBlue. Yup, that little plane brought us all the way from coast to coast again. We unpacked it, buttoned it up, and headed off in the FBO’s crew car to take a look at the Air & Space hangar at Dulles, where they have a space shuttle and all sorts of cool aircraft to see.